Podcasts are becoming a viable medium for storytelling in India. 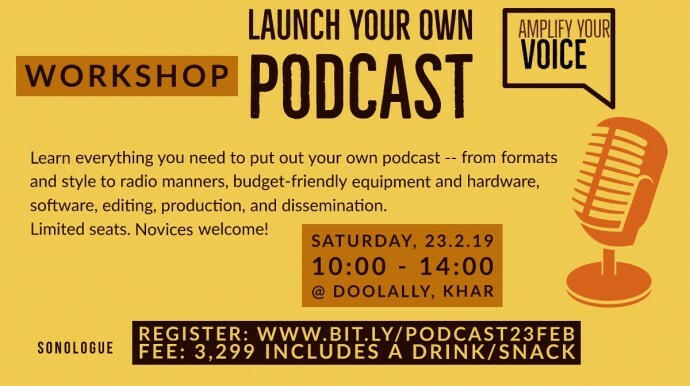 If you have a story, opinion, or expertise you want to share, come learn everything you need to launch your own world-class Podcast. We'll cover what formats will suit your idea best, how to plan for it, best practices, hardware and equipment, software, and even do some hands-on recording and get an overview of production as well as dissemination. You'll leave equipped to rock the Podcasting world! Once you sign up, you'll receive an email with details as well as a link to a trial of Hindenburg audio editing software. More about the instructor: Chhavi Sachdev is a multimedia journalist and podcaster who started podcasting in India in 2008. She has taught radio journalism as well as various levels of podcasting production at institutions, non profits, colleges, schools, and media organizations. Read more at: www.sonologue.com. More information on the workshops is at www.sonologue.com/workshops. Share "Launch your own podcast (intro to Podcasting)"